For much of this season on Agents of S.H.I.E.L.D., Director Coulson and his various team members have been focusing on their own individual missions. Daisy has been helping to transition newly transformed Inhumans while also vying for a special team made up of powered individuals. With the help of May, Hunter attempted to go after Ward -- who has been rebuilding Hydra in the image of S.H.I.E.L.D. -- as revenge for what he did to Bobbi at the end of season 2. Fitz focused on saving Simmons from the foreign and distant planet, then on learning as much as he could about it once she had returned. All the while, Coulson grew closer to Rosalind Price, the head of the ATCU, in an attempt to learn more about the organization that was also tasked with dealing with Inhumans. However, in the last episode, 'Many Heads, One Tale' all those missions came together when it was revealed that a branch of Hydra led by Gideon Malick (Powers Boothe) was secretly operating inside the ATCU, and he has been maintaining the legacy of the rogue organization, which has connections to the monolith that opens the portal Simmons went through in the season 2 finale. Now in this week's episode, 'Closure', written by Brent Fletcher and directed by Kate Woods, Coulson and Ward seek their own closure in their relationship (if you can call it that) while Malick looks to open the portal to the planet, which Fitz has dubbed Maveth. 'Closure' is by far the most action-packed and emotionally-driven episode of Agents of S.H.I.E.L.D., setting up an intensely dramatic midseason finale. Agents of S.H.I.E.L.D. has largely taken its time in season 3 by setting up all the plot threads needed before they all came together in the reveals of 'Many Heads, One Tale'. 'Closure' manages to capitalize on all that exposition to get the ball rolling almost immediately, and keep up a fast-paced momentum for the entire 44-minute episode. 'Closure' opens on a quiet romantic scene between Coulson and Rosalind that is carried by the actors' chemistry -- which they've had since episode 1 of season 3. However, their romantic evening is cut short when Ward shoots Rosalind with a sniper rifle, killing her in an effort to repay Coulson for S.H.I.E.L.D. 's part in Agent 33's death last season. Ward's actions set the Director of S.H.I.E.L.D. into an emotional spiral that has been earned by the season-long relationship between him and Rosalind, which finally took a big step forward in the last episode. Coulson deals with the grief of Rosalind in different ways throughout 'Closure'; in the scene when he returns to base, he is closed off from everything and everyone around him, then he channels his emotions into building a profile of Ward based on interviews with his season 1 team. Finally, Coulson's emotional arc culminates in the rash decision to dive after Ward through the portal to Maveth. Gregg demonstrates again and again throughout the episode why Marvel TV and ABC made a smart choice in building the entirety of Agents of S.H.I.E.L.D. around his character as he pulls off the emotional heart of 'Closure' spectacularly. While Coulson is learning as much as he can about Ward, the Hydra agent is still focused on getting his revenge, which includes killing the director of S.H.I.E.L.D. However, Malick forces Ward to look beyond his vendetta, toward Malick's vision for the future of Hydra, which includes going through the portal to Maveth and bringing back the being that plagues the planet. Like Coulson, we see Ward struggle between following his emotions -- his anger -- and following a path toward something new: becoming even more embroiled in Hydra when he stops using the organization as a means to his own personal gain. However, unlike Coulson, Ward chooses a new path, which lands him in the leadership position on the Hydra mission to Maveth (that also includes Fitz). 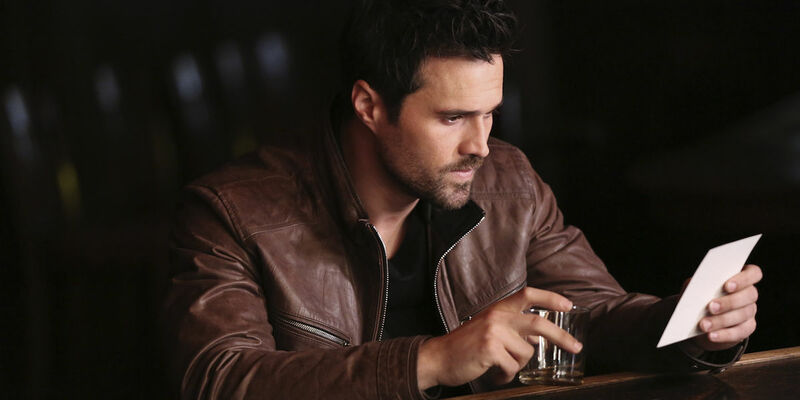 Just as Ward says in 'Closure', he and Coulson are two sides of the same coin and that is especially seen in this episode through their emotional arcs, taking the characters in two similar but ultimately different directions. We also revisit Ward's character from season 1 through Coulson's interviews with the team as May, Fitz, Simmons, and Daisy are forced to discuss their former friend/ally -- giving these characters closure as well with their relationship with Ward. Coulson learns even more about the Hydra agent when he kidnaps Ward's younger brother, Thomas. The brothers confront their shared history as well as the turn in Ward that happened during their childhood. But, whereas Coulson allows his emotions to rule him more and more as the episode progresses, Ward grows more calm and focused until finally prioritizing Hydra over his vendetta against Coulson. This dichotomy between the two characters pits them as formidable foes that will come face to face in the next episode. Although the storyline of Fitz rescuing Simmons from Maveth, learning how to operate the portal and discovering Hydra's connection to the planet has been instrumental to moving season 3 forward, the relationship between the two scientists has been just as fascinating to see. 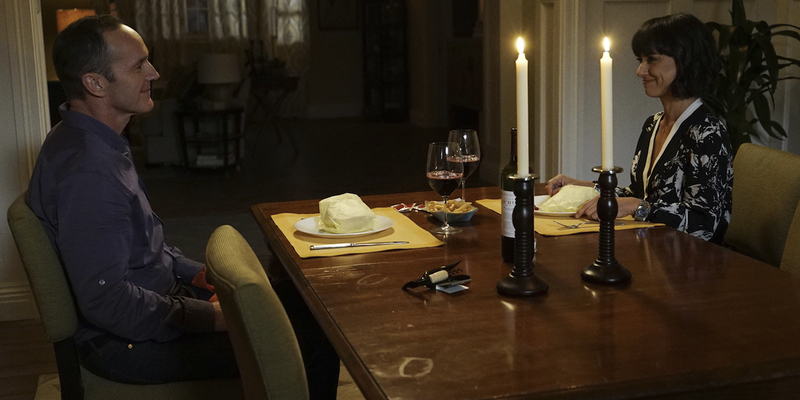 Viewers have had to watch Fitz and Simmons throughout seasons 1 and 2, as well as this first run of season 3, as the pair have attempted to pursue a romantic relationship only to be stalled by obstacles in their way -- whether they were Fitz's injury or Simmons' time on Maveth, and the relationship she developed while marooned there with Will. The will-they/won't-they tension of the two came to a head in the last episode when they kissed, but it wasn't clear what impact that would have on their relationship, especially since it didn't solve the problem of Will. However, Fitz and Simmons get their own kind of closure in this week's episode as they demonstrate their own individual strengths as well as the strength they find in each other. Malick and Ward capture the pair with the intent of learning how Fitz managed to bring Simmons back through the portal, which Hydra had never been able to manage. Ward splits Fitz and Simmons up and he tailors the nature of torture to each -- Simmons is physically tortured as a way to emotionally torture Fitz. Although Fitz breaking down is a rather predictable, albeit serviceable, moment, it allows for a later scene when he shows that Simmons is where he finds strength. She also demonstrates her feelings toward him in telling Fitz that she cares more about him safely returning from Maveth than his mission to bring back Will. As always, the relationship between the two is made possible by Elizabeth Henstridge and Iain de Caestecker, who manage to carve out their own compelling moments in such an action-packed episode focused more on other characters. Before Coulson truly goes after Ward, he has the foresight to step down as Director of S.H.I.E.L.D., naming Mack his replacement since the agent is level-headed and doesn't have any emotional investment in taking down Ward. Certainly, Mack's new role as director would be a footnote to the massive events of 'Closure' except that it leads to the official formation of the Secret Warriors -- though they haven't been called that quite yet. With Coulson diving headfirst after Ward through the portal to Maveth, FitzSimmons captured by Hydra, and the rest of their forces spread too thin, Mack makes the call to finally give Daisy the go ahead to assemble her team of powered individuals. Like the other storylines that reached a turning point in 'Closure', the slow development of the Secret Warriors throughout season 3 leading up to the moment when Daisy greeted her team -- consisting only of Lincoln and Joey -- felt wholly earned and more than a little exciting. Considering Mack was one of the team's detractors from the beginning, Agents of S.H.I.E.L.D. needed to establish a situation where he would actually consider giving the team the green light. 'Closure' managed to do just that, while also giving Henry Simmons more to work with than he has had all season; Mack even gets the grand motivational line of the episode: "Either you step up and do the damn job or you let the bad guys win." Now we just need to see the Secret Warriors in action. In addition to Rosalind, her right hand man, Banks, was also killed in this episode. Is this the end of the ATCU? Ward makes a references to Mad Max: Fury Road, commenting on Simmons' "Furiosa vibe"
Share your thoughts on the episode and theories about what’s to come during the midseason finale in the comments below!